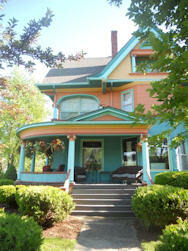 One of the older homes in Oregon is the Queen Anne style house built in 1897 for Mr. and Mrs. L. B. Marvin. Marvin was then 23 and the eldest son of local hardware merchant, H. H. Marvin. The lot was purchased from his grandfather, Oregon pioneer, A. B. Marvin. By May 20th of that year, C. B. Kellor and Rasmus Anderson were laying the foundation walls for the new house. By July 22nd the house was ready for its window and door casings and its floor, and by August 26, the Marvins were at home in a house the local paper called, “One of the finest in town.”The Marvins lived there until 1901 when they traded this house for another owned by Mabel Marvin’s father, M. R. Terwilliger. Terwilliger then rented the house to Franklin Gould. Gould added a summer kitchen to the rear in 1902, then purchased it for $1800 and lived in it until 1906, when he sold the house to retired farmer, Sheldon Tusler and his wife. The Tuslers lived here until Mrs. Tusler’s death, and the house was afterwards occupied for many years by their daughter, Hattie Tusler Black. Edward and Sally Jo Quamme purchased the house in 1985. 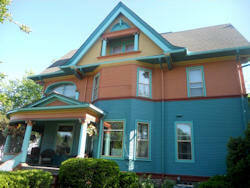 They initiated a much-needed interior and exterior restoration project. Fortunately, the house was still in largely original condition and the work that was done consisted mainly of redecorating in a historically appropriate fashion and updating such rooms as the kitchen and bathrooms. The Quammes did most of the work and Mr. Quamme’s brother in Montana crafted the beautiful wood kitchen cabinets. The result is one of Oregon’s most intact and best kept Queen Anne style houses.After the Quamme’s, Kathie and Bruce Bahman owned the home for three years. Edward Lyon purchased the home in 2007. The entire landscape has been transformed into a garden. Lyon is the director of the Allen Centennial Gardens on the University of Wisconsin-Madison campus. One of Oregon’s earliest settlers, Robert Thomson settled in section 12 of Oregon township in 1841. He purchased 46 acres from the government and built a log cabin on the bank of what is now Thomson’s Creek, near Janesville and S. Perry Parkway. He died in 1882, leaving 42 acres to his daughters, who in turn sold it to Robert’s nephew, George Thomson (a carpenter) and his wife Ella. 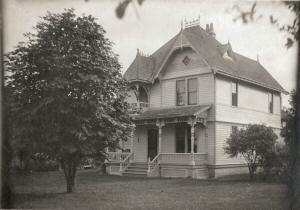 George built the larger home in 1889 at that same location, next to the current site of WISCO Industries. The house was built during a time when “gingerbread” was popular and George Thomson added scrollwork and Victorian decorative features. There is a stained glass window lighting the stairway to the second floor. A small balcony opens from the stairway, over the front entrance. That is where they would shake rugs. George and his wife Ella farmed the land and lived there until George died in 1927. Ella remained there until she died in 1938. The house and farm were left to their daughter, Janet Thomson, who was teaching in Michigan. She lived in the house only in the summers and she rented out the land. Janet Thomson married Charles Friday in 1947. By 1948, an attached garage, and an upstairs bathroom were added. A fireplace was built in the 1950’s. When Janet died in 1958, the home was left to her husband, Charles Friday, and her niece, Ellen Peterson Robinson, and Ellen’s son, Keith Robinson. Charles Friday died in 1973 and Ellen moved into the home in April of 1974, after several improvements had been made. Ellen Peterson Robinson, George Thomson’s granddaughter, was the last family descendent to live in the house, until her death in 1992. Her son, Keith Robinson sold the house in 1993 to WISCO Industries, Inc., which is located next door. 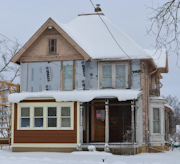 WISCO needed the land for future expansion, and wanted a buyer to move the historic home, saving demolition costs, and saving this historic Oregon home. Jim and Sandy Ness purchased the house and arranged to have it moved in 1995 to a 7.5 acre lot overlooking the Town of Oregon, south of Autumn Woods on Highway MM. Phil Harms, of Advantage Builders in Oregon, served as the general contractor for restoring the unique home. Jim’s dad, Peter, and friends, Thor Gotrick and Marlene Winters, helped with tearing down and putting it all back together. It was 16 months before they could move in, and around 6 years before every room was completed. The extensively landscaped lot makes the house look like it has always been at the top of the hill where it is situated. American Queen Anne style house es are characterized by an irregularity of plan and massing and by a variety of surface textures, roofs, and wall projections. Shingle or clapboard siding predominates and sometimes is used above a brick ground story. Roofs are steeply pitches, usually with a dominant front-facing gable; and cutaway bay windows are frequently employed, as are round or polygonal turrets. The asymmetrical facades often display wrap-around verandas as well. Architectural details are normally of a classical nature and tend to be small in scale, overwhelmed by the building itself. All of these stylistic characteristics can be seen in the imposing house that retired farmer John Gilbert built for himself and his wife Flora on North Main Street in 1906. Gilbert was born in 1861, the son of Dane County pioneer Schuyler Gilbert, and he had farmed 250 acres near Oregon for 25 years before moving into town in March of 1906. Gilbert died in 1956 at the age of 95 and this largely intact home was acquired by Michael and Alice Seeliger in 1977. They did an extensive amount of work to restore the home. Jan and John Bonsett-Veal bought the Gilbert home in 2001 from the Seeliger’s. John is a practicing optometrist in Madison, WI and Jan retired from the Oregon School District in July 2011 after holding several administrative positions in the school district over the previous 23 years. They have four children who enjoyed growing up in this lovely home. Since living here, Jan and John have continued the remodeling that the Seeliger family began. The kitchen and bathrooms have had complete updates and the upstairs attic has had heating and air conditioning added so that it is a useable space year round. 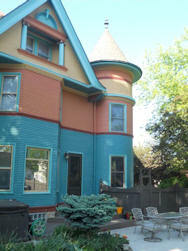 Over the past few summers, the exterior of the home has undergone major repairs, all with approval of the Wisconsin State Historical Society, and experienced a new color scheme. 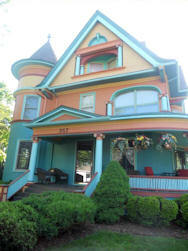 The three shades of teal, accented with rust, gold and red make it a true Painted Lady. Presently, the second floor of the home is undergoing renovation. Carpeting has been removed and the original wooden floors refinished to reveal the original, beautiful knotted wood (pine or fir) throughout. 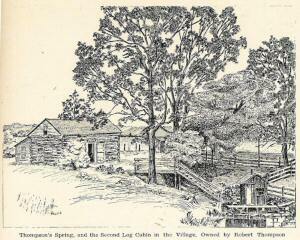 Reference: Historic House Walks, May 19, 1991, Village of Oregon Sesquicentennial Celebration, Pamphlet. Pers. Comm. –Bonsett-Veal family 2012. The Lincoln Street Historic District in Oregon contains a cohesive collection of five single-family residential properties dated from c1870 to 1894. At the end of 1842 Bartley Runey, his wife, three boys and four girls, and Robert Thompson were the only residents in the Township of Oregon. The next year, 1843, C. P. Moseley settled on the present site of the Village of Oregon, built a cabin and opened a tavern on the old territorial road running from the lead regions near Dodgeville to Milwaukee. 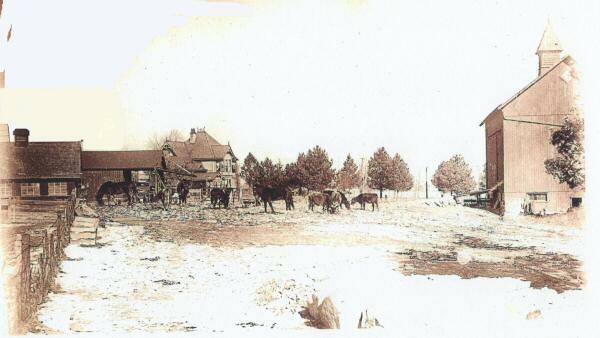 This log cabin-tavern became the stopping place for teamsters drawing lead to market. This stop became the nucleus of the thriving Village of Oregon. The population of the Village was enlarged in the year 1844 by the arrival of Reuben Boyce and family in Section 36, Stoddard Johnson in Section 1, W. F. Lee and Schuyler Gilbert in Section 10. By 1845 Joseph Algard and family had settled on Section 17. Also in 1845, Nathaniel Ames, his three sons and grandson, arrived in the area. These early pioneers are identified with the history of Oregon, having witnessed its gradual development and growth. Other families prominent among the first settlers were J. S. Frary, S. J. Pratt, Abraham Kierstad, W. S. Bedford, Roswell Babbitt, Phineas Baldwin, R. P. Main, E. W. Dwight, Tipple, Hook and Fox. The original plat of this Village was surveyed on the lands of Charles C. Waterman, William S. Bedford, A. S. Mygatt and John D. Tipple. Additions were made by S. S. Johnson, Abraham Kierstad, E. E. Bedford, William S. Bedford and L. W. Parson. The West Lincoln Street Historic District is a part of the Stoddard Johnson Addition to the Village of Oregon. At the time the surveyed land was recorded, on September 10, 1863, the street name was listed as Third Street. A check of the map indicates the location of the various properties surveyed within the Johnson Addition. This property was originally part of Mr. Johnson’s 40-acre farm. It was when the Methodist church was first organized that Mr. Johnson had his property surveyed. He gifted his property on the corner of First Street and North Main Street to the Methodists for them to build their church. Stoddard Johnson was born in 1807, location unknown, and died in Oregon in 1879. He is buried in Prairie Mound Cemetery, Section 2, Lot 153 and Grave 2. Also in Section 2, Lot 153, Grave 3 is a Patty Waite Johnson, born 1789 and died 1852, and an infant Isaacs Johnson, born 1847 and died in 1848, buried in Grave 4. Today, the Lincoln Street Historic District is located along West Lincoln Street in downtown Oregon. 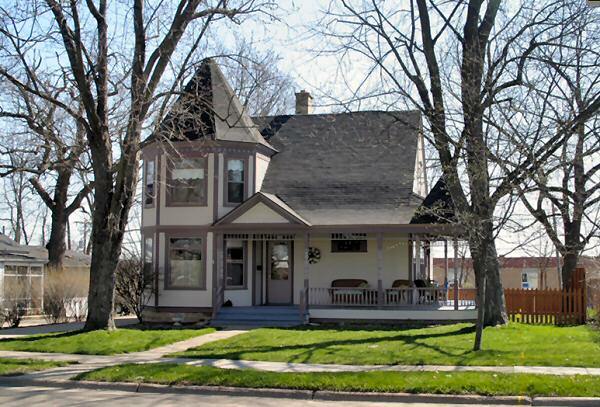 The district consists of five single family residential properties dating from c. 1870 to c. 1894. All of these residences are contributing elements within the historic district, which is located west of North Main Street and east of Market Street. The architectural style of the district is predominantly Queen Anne but a vernacular hip roof house and Gothic Revival home add stylistic variety. The properties along West Lincoln Street are primarily residential with the exception of the Oregon Area Historical Society, which was historically a railroad hotel. The Chicago and North Western Railroad, finished in 1864, runs parallel to Market Street. The depot was located at the intersection of Lincoln and Market Streets, west of the railroad tracks. The setbacks within the district average 25 feet, and mature trees line the sidewalk terrace. Four properties feature clapboard siding and the remaining house is constructed of brick. The properties display limited changes or alterations and retain good integrity. The district also includes one contributing garage and three noncontributing garages and sheds that were constructed outside the period of significance. The district contains a cohesive collection of residential properties built by prosperous individuals whose involvement in local commerce and politics enabled them to build significant residences in the late nineteenth century. The homes are of a similar size and scale, and collectively represent the period of late nineteenth century residential development in the village. 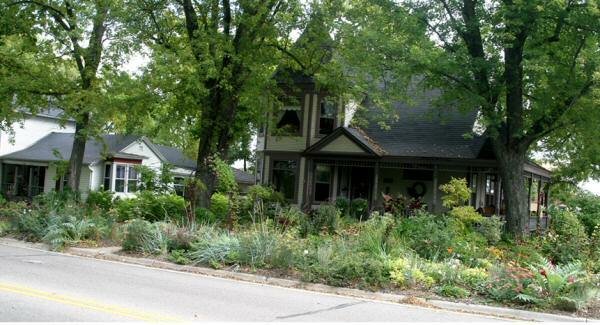 “The Village of Oregon, West Lincoln Street Historic District. Entered on the Wisconsin State Register of Historic Place by the State of Wisconsin Historical Society on January 20, 2006. Entered on the National Register of Historic Places by the Secretary, U.S. Department of Interior on April 12, 2006 (copy available at OAHS). Emily Pettis, Historic Preservation, Mead & Hunt, Inc.